So you wouldn’t think that on my health and nutrition blog I would be writing about mixing up my own hooch! But since the key with drinking alcohol is moderation, what better way to be moderate than to work hard at making your own hand-crafted booze and then not want to drink too much because you don’t know when you will get to making more again. At least that was my perspective when I signed Adam and I up for an ”Infusions & Liqueurs” class at 18 reasons (an awesome local non-profit “engaging the community through art and food”). I was also into the idea that when making your own magical mixes you can skip the HFCS (found in most syrups like grenadine) and control the amount of sugar that suits you best. Plus cool points with your friends when you can offer them unbranded bathtub gin from a bottle and the possibility we could get really get into it and make holiday gifts-bring it on! The class was full of other eager students and our maestro Sean from Punk Domestics was able to keep things light and fun but also impart pearls of wisdom (like the best way to get seeds out of a pomegranate- score, split open, release seeds under water!) and keep us on task. Each group tackled a different recipe and we were pleased to make the Pomegranate Liqueur, especially since I am a huge fan of Pomegranates. Pomegranates are an ancient fruit that are grown all over the world (Asia, Middle East, Mediterranean, California) and are known for their high antioxidant content as well as Vitamin C. They contain several types of antioxidants, including the polyphenol variety, which are considered to be helpful with heart disease and preventing cancer. 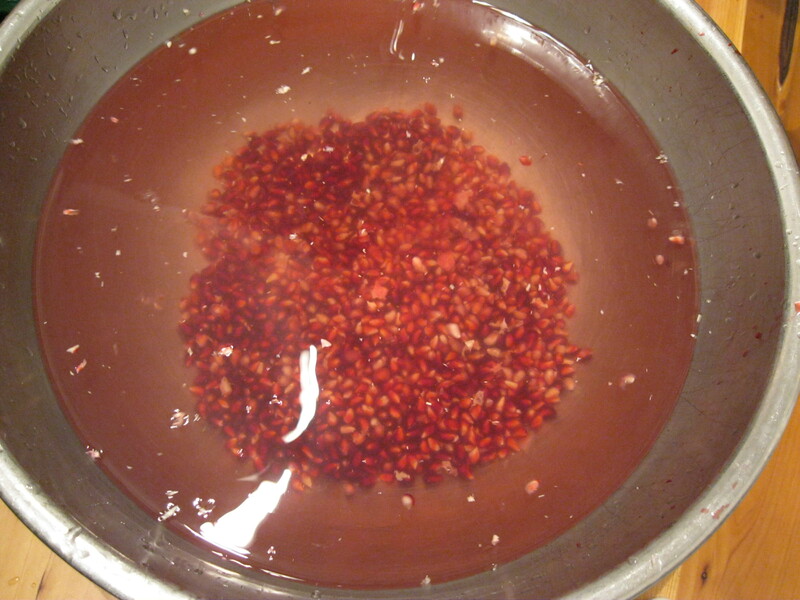 To make the liqueur we took the seeds from 3 small pomegranates and then pulsed them in a food processor to extract the juice. 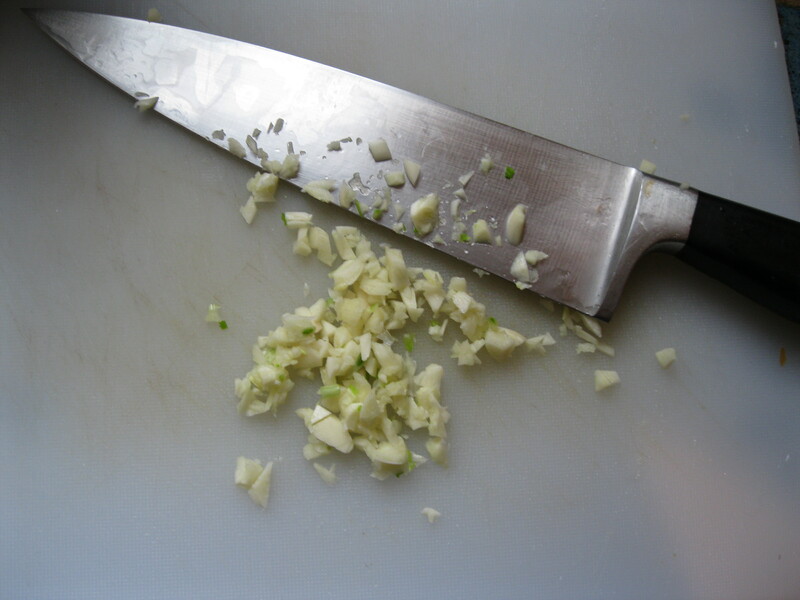 The juice and pulp mush then got vodka added to the jar with lemon zest but would need to sit and steep for at least 2 weeks. Sean had kindly brought us the steeped version of what we had just created and we were able to go on to the next step….straining. After making an X shape with two strips of cheese cloth in a big funnel device (big metal gadget= cool!) 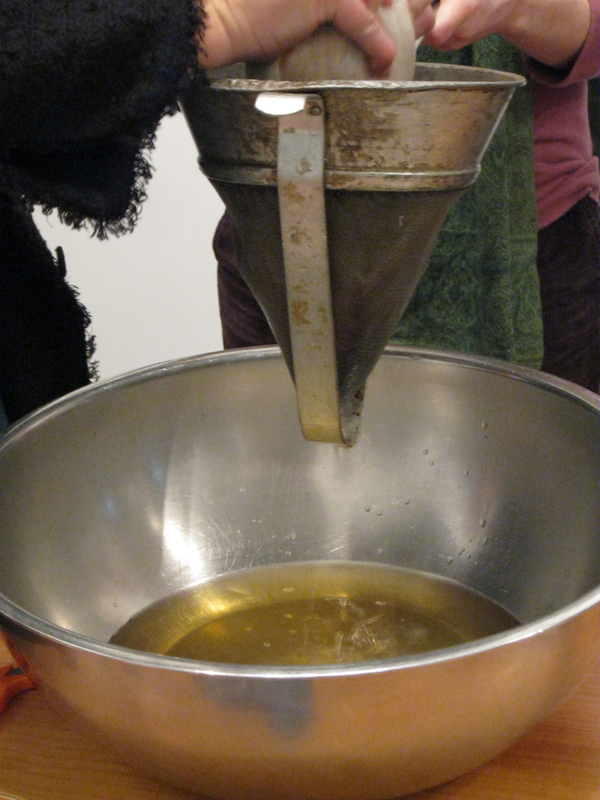 we poured the mush ‘n juice through the cloth and collected just the liquid. Since this liquid was still a bit cloudy, we then did a second straining, this time through a paper coffee filter. Et viola, we had our pomegranate base. 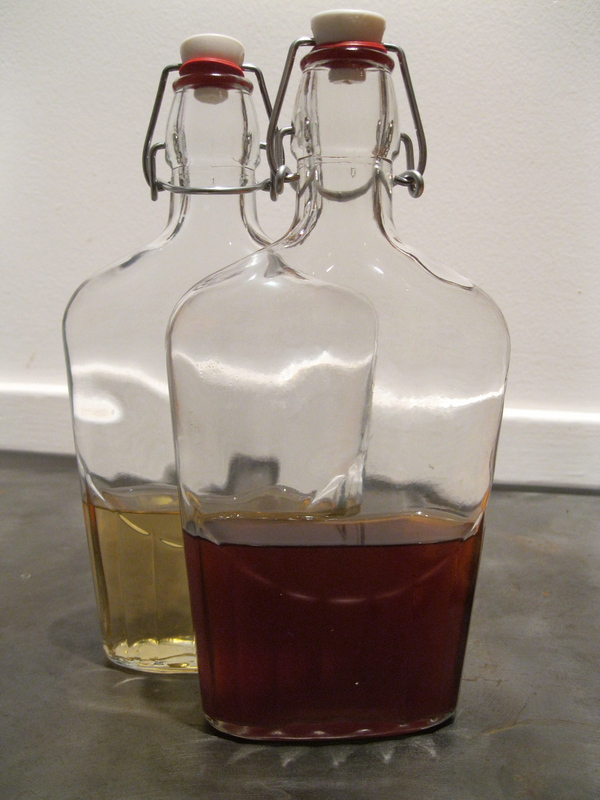 The last step was to add our homemade simple syrup (sugar and water heated then cooled) and put a stopper on our bottle. So easy! During all this fun we were able to taste samples of what the other groups were making….Gin (who knew this was just Vodka + Secret Ingredients like Juniper berries), Loquat, Pluot and Quince Liqueur (I felt very fancy typing that), Spiced Rum and another personal favorite, Pompelmocello (like Lemoncello but with Grapefruits). Hic…all the tasting was delicious. We got to go home with about 8 ounces of our goods (Adam chose Gin and I will be hoarding my Pomegranate Liqueur) and the evening certainly helped me appreciate cocktail hour in a whole new way. 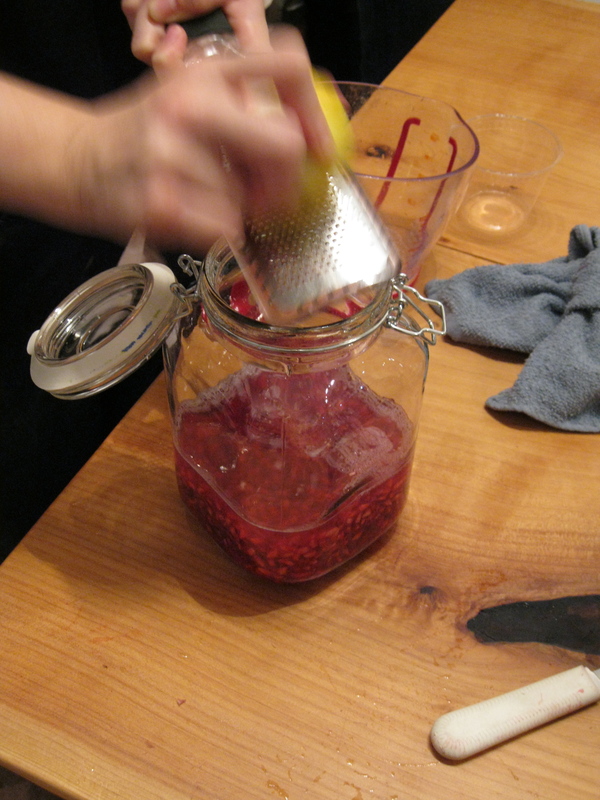 For the Punk Domestics recipe for Pomegranate Liqueur click here.